We are addressing ourselves to the subject of The Catholic Discovery of America. This year is the five-hundredth anniversary of the discovery of America by Christopher Columbus. It is also the five-hundredth anniversary of the birth of Christianity in the Western world. It is, finally, the five-hundredth anniversary of the beginnings of the Catholic Church in North and South America. Our Holy Father, Pope John Paul II, is coming to Central America on October 12th of this year to the Island of San Salvador where Columbus first landed in the New World. The Pope's pilgrimage will be gratitude to God for planting the true faith in America. It will also be an earnest prayer to God for a strengthening of this faith where it has weakened and for a restoration of this faith where, as it has been in millions, been lost. Much has happened in the 500 hundred years since the Catholic faith was brought to America. There have been marvels of grace performed by the Catholic Church in the Western Hemisphere during the past half millennium. But much, very much, has still to be done. Our purpose in these lectures is to develop our basic theme, which I call “The Catholic Discovery of America." Our focus will not be on the discovery of America, which is obvious. It will be on the Catholic discovery of America which, I assure you, is not obvious. What do we mean by the Catholic discovery of America? We mean the discovery of America by Spain, a country that for 700 years had suffered martyrdom under Islam, in defense of the Catholic Faith. We mean the discovery of America made possible by the apostolic zeal of Isabella I, the Catholic Queen of Spain. After seven centuries; the Moors were finally driven out of Spain in the year 1491; 1492 came on the heels of seven centuries of martyrdom. We mean the discovery of America achieved by the Catholic genius of Christopher Columbus. We mean the discovery that was inspired by the Catholic vision of the Franciscans in Spain, without whom Columbus could never have been able to undertake his voyage to what became the new world. We mean the discovery of America that planted the seed of the Catholic Faith through the missionaries who evangelized the Americas and, how happy I am to say, and covered with the blood of many martyrs including my own Jesuit confreres. We mean the discovery that was blessed by Our Lady of Guadalupe, during the lifetime of Fernando Columbus, the youngest son and biographer of his father, Christopher Columbus. We mean the discovery that was seen by the Roman Pontiffs as the dawn of a new era in Catholic evangelization. We mean the discovery that should inspire us to preserve, to purify and to promote the faith that so many of our forbearers, since 1492, have labored, suffered and died so that we might be believing Catholics today. In the seven lectures planned for our series, we shall look in sequence, at each of these meanings of The Catholic Discovery of America. My hope is that these lectures will not be lectures in any ordinary academic sense, but lessons of faith as we mark a turning point in American Catholic history. Why Speak About the Catholic Discovery of America? 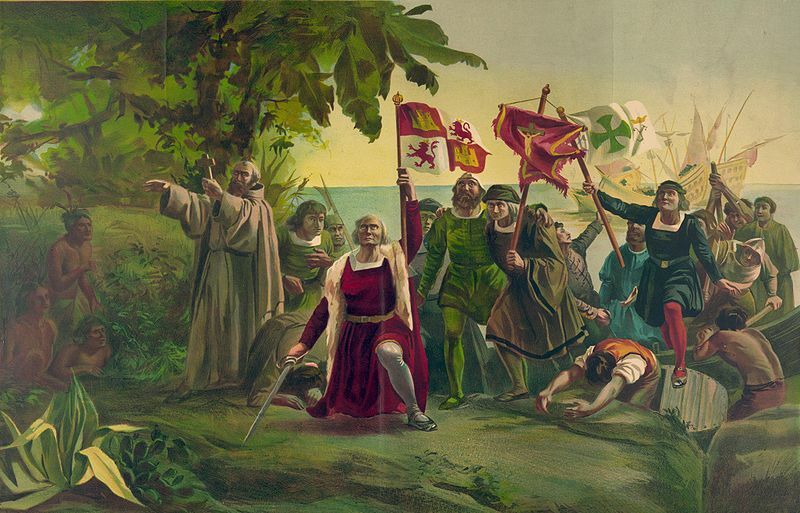 Before we begin to look at the Catholic faith of Isabella and Columbus, the two people most responsible for the discovery of the new world, there is more than passing value in asking ourselves a very basic and ordinary question: Why should we even consider the Catholic Discovery of America? There are many reasons and they are all powerful motives for defending what crucially needs to be defended. That except for the Catholic Church, there would not have been a discovery of the New World as we know it. There would not have been the providential opening of two continents to the true Faith. There would not have been the perfect timing between the loss of six whole nations in Europe who were lost to Catholic unity and the rise of new countries where, by now, hundreds of millions have lived with faith in Christ's Real Presence in the Holy Eucharist and died as faithful sons and daughters of the Roman Catholic Church. God timed, He timed the breakdown of Catholic unity in so much of continental Europe, England, Wales, Scotland, Norway, Sweden, Denmark were completely torn away from union with the Bishop of Rome. And much of Germany and much of Switzerland along with them. If ever St. Paul's words were verified that where sin abounds, there grace even more abounds. It is unspeakably true in the perfect timing by God between the loss of the Faith in so much of continental Europe and the discovery of a new world that, by now in the last 500 years hundreds of millions of Catholics have lived and died in the western hemisphere. We know, how well we know by now, what an authentic Catholic is. An authentic Catholic believes unqualifyingly that the Child in Mary's arms on Christmas morning was her God. A Catholic believes that when Christ left the Earth in visible form on Ascension Thursday, He did not leave the Earth into which He was born. Why not? Because we believe in the Real Presence of Jesus on Earth in the Holy Eucharist. An authentic Catholic believes that one man, the Bishop of Rome, is Christ's Vicar and final court of appeal on what we must believe and how we must behave. I repeat, for the last 500 years hundreds of millions of people have lived and died believing what we've just identified as authentic Catholic Christianity, but only because there has been a catholic discovery of America. As you read the books and periodicals anticipating, now during the present year, commemorating the quincentennial Columbian anniversary, we are struck by these books and periodicals to be almost totally secular in their interpretation of what really took place in 1492. Geography, Astronomy and History, Economics and Politics, Sociology and Paleontology are woven into a huge literary tapestry in which God and religion and Jesus Christ are scarcely mentioned and from which that every named Catholic is scrupulously excluded. In pondering lectures over the last several months, I thought I would begin by describing what happened in 1891 when, as I'm sure you know, there was the four hundredth anniversary of the discovery of America. And do you know why? It would have been relevant to talk about it in Chicago because Chicago was where this international Columbian anniversary took place. You read what people said about Columbus and about the discovery of America from the proceedings of the Columbian exposition in 1892, you read it and you weep. Whatever else we'd better know, we better know what really happened in 1492. Some writers openly accuse Columbus of invading the land of the American Indians. Others charge Columbus with introducing slavery. Still others claim that if anyone is to be given credit for discovering America, it should be Eric the Scandinavian centuries before Columbus. We who believe in Divine Providence know that the discovery of America was not coincidental. I don't hesitate saying it was planned by God from all eternity. Just before His Ascension into Heaven, Our Lord told His disciples, I quote, "You will be my witnesses not only in Jerusalem but throughout Judea and Samaria and indeed to the ends of the earth" (Acts 1:8). Our task here will be to see how the prophecy of Christ was fulfilled just five centuries ago, when the followers of Christ became His witnesses, and as I've told so many of you, our Lord's words in the Acts of the Apostles from which I've quoted, when He said you will be my witnesses, the Greek of the inspired text is: "You will be my martyrs" literally, "to the ends of the earth" including the western hemisphere and, dare I say, including Chicago. My plan for the rest of this lecture is to talk about two people: Isabella, the Catholic and Christopher Columbus, the discoverer. We cannot begin to understand the Catholic discovery of America without knowing something of Isabella I, Queen of Castile. Born in 1451, she died in 1506. In 1469 she married Ferdinand V, King of Aragon, and then, together with him, united the two countries into the modern nation of Spain. Among their five children was Catherine of Aragon who married Henry VIII, the woman whom Henry the eighth discarded yet it was Catherine of Aragon's parents who were responsible under God, for promoting and making possible the discovery of the new world. Isabella was a deeply religious woman. Her strong character joined with an ardent faith has made her the object of violent criticism for her role in the Spanish Inquisition. The Inquisition was not a mistake, but whatever mistakes Isabella made, and she made mistakes, no one could possibly question her strong heroic devotion to Catholic truth. Among the many letters that Isabella received from the Popes is one from Pope Sixtus IV who wrote to her and I quote, "Very dear daughter, we know that your person is distinguished by many royal virtues, through the divine munificence; but we have commended none more than your devotion to God and your enduring love for the orthodox Faith" (Walsh, Isabella of Spain, 264). God made sure that when America was to be discovered, two people of heroic stature in their devotion to the Catholic faith, Isabella and Columbus, should have been responsible for the world-changing phenomenon. By 1492, Columbus had made three unsuccessful efforts to persuade the Iberian royalty to authorize his search for the Indies by crossing the Atlantic. Twice in Spain and once in Portugal, royal commissions decided against financing the expedition of Columbus. A third effort to get Spanish support failed in early January 1492. It was then that Queen Isabella entered American history. Her cause for canonization was introduced but violently, militantly opposed by those who then not wanting a resurgent Catholicism in the new world, I will say, postponed the canonization of Queen Isabella. Her husband, Ferdinand, did not think that Columbus had good judgment in hoping to reach the Far East by going to the West. Ferdinand did not take Columbus seriously. Here is the way Ferdinand was thinking: "Here is a foreigner, (Columbus was Italian by birth) already turned down by the Portuguese for his dreamy scheme. Add to this Columbus' reserved--some would call it a secretive character." "No," said Ferdinand, "Columbus should not be allowed to damage the reputation of Spain by venturing on a fanciful voyage that would only send a hundred or so men to their watery graves." Queen Isabella did not agree with her husband. She prayed and she fasted that she might be able to persuade her husband to agree with her in backing Christopher Columbus. She had too much experience with God's mysterious ways to reduce Columbus to a starry seaman who did not know what he was talking about. Columbus later described the skepticism of everyone else, except Queen Isabella, about crossing the Atlantic to reach the Indies. "In all men," Columbus wrote, "there was disbelief. But to the Queen, my Lady, God gave the spirit of understanding and great courage, and made heiress of all, as a dear and much-loved daughter" (Walsh, 337). The rugged holiness of Isabella is revealed in every biographer of the Queen. It was in large measure due to her zeal for the preservation of the Catholic faith that she, like Joan of Arc, led on horseback the Spanish troops to recover her country from the seven centuries of control by the Moors of Islam. It was because she saw the harm being done to the Catholic Church by the pseudo-converts, called conversos, that she organized, with the full approval of the Holy Father, the now much maligned Spanish Inquisition. It was this same woman, who prayed much, who had a great devotion to the Blessed Sacrament, who had a regular confessor – and she went to the Sacrament of Confession frequently. In her humility (and this is part of her writing) she recalls how she was reprimanded more than once by her confessor for her vanity in dress. It was this saintly woman who saw, with God's grace, in Christopher Columbus the man destined by God to open a new world to the Gospel of Jesus Christ. In the past 500 years, several thousand books have been written about Columbus. Depending on the author, myriad aspects of his character are described and analyzed. I've read many books in anticipation of this series. It all depends on whom you read but most of the biographers of Columbus tend to explain why it was Columbus who discovered America. They ask and they don't have the answer. Why, for example, the native Americans did not discover Europe. Many people, long before Columbus, had a sophisticated knowledge of Astronomy which is the basis of what we call celestial navigation. Why have the Chinese or the Arabs not ventured across the Atlantic Ocean? In the Middle Ages, China was the wealthiest nation in the world. They had tremendous power over the seas. So too the Moslems had extended Islam from the Mideast to the farthest reaches of Western Europe and the most distant lands of the Far East. Why not the Chinese? Why not the Moslems? Why Columbus? Anyone who knows the history of Chinese and Moslem societies in the 15th Century would have said that they and not Europeans would be the persons to cross the Pacific or Atlantic Oceans. To us it seems incredible that for centuries, many centuries most of what we identify with the ancient world did not even know that what we now call the new world existed. There is no natural explanation of why it should have been Columbus, but once we draw on the resources of Revelation we can see why. It was because the God who became man wanted His message of salvation to be extended by strong Catholic believers to people who were still walking in darkness and had been untouched by the Gospel. From this perspective, the deep, even aggressive, Catholic Faith of Isabella and Columbus provides the explanation. They were deep believers; they were also aggressive missionaries. Needless to say in our day, 500 years later, we too might then need a deep faith – and I mean it – and aggressive apostolic zeal. In our next lecture we plan to see in more detail how Columbus put his Faith into practice. Our present focus is on the manifestations of his faith as seen in the detailed, day by day log which Columbus kept from August 3, 1492 when he left Spain to October 12, 1492 when he set foot on the new world. I have a number of logs of Columbus at my disposal, but to make sure I'd have the latest available in print, I ordered a brand new copy. To make sure I'd get it in time, I asked them to send it to me express mail. You read that log of Christopher Columbus and you are overwhelmed by the man's deep Catholic faith. The log begins with a prayer: "In the Name of our Lord Jesus Christ." The spirit of this opening prayer pervades the entire log. Throughout the log Columbus is constantly invoking the Name of Christ or God or Divine Providence. He is thanking our Lord and expressing his confidence in the power of the Almighty to bring to realization what for so many years people were telling him was a wild mirage. I would like to now quote and give you the dates from Columbus' log revealing the simplicity and the depth of his faith. "Today, praised be to God, I arrived at Gomora and sent a boat ashore." "My enterprise is in God's hands." "By divine providence the wind shifted and we made some progress." "God must have planned it that way." "The rudder is almost finished, praise God." "All the indications of land come from the west, where I trust Almighty God, in whose hands are all victories, will soon deliver us to land." "It is my desire to go directly to the Indies and not get side-tracked with islands that I shall see on the return passage, God willing." "When the sea made up considerably without wind, they [my crew] were astonished. I saw this as a sign from God, and it was very helpful to me. Such a sign has not appeared since Moses led the Jews out of Egypt, and they dared not lay a violent hand on him because of the miracle that God had wrought As with Moses when he led his people out of captivity my people were humbled by this act of the Almighty." "I am having serious trouble with my crew, despite the signs of land that we have and those given to us by Almighty God. In fact, the more God shows the men manifest signs that we are near land, the more their impatience and inconstancy increases, and the more indignant they become against me." "At sunset, Martin [one of the crew] mounted the stern of the Pinta and with great joy called to me that he saw land and claimed the reward [to the one who first sights land]. When I heard this stated so positively, I fell to my knees to give thanks to our Lord, and Martin said `Gloria in excelsis Deo' with his people. My people did the same thing." "The wind abated somewhat during the night. The sea is pleasant and calm. Many thanks be given to God." "Joy turned to dismay as the day progressed, for by evening we had found no land and had to face the reality that it was only an illusion. God did offer us, however, a small token of comfort: many large flocks of birds flew over, coming from the North and flying to the Southwest. They were more varied in kind than any we had seen before, and they were land birds." "All night long we heard birds passing. We must be very close to landfall, thanks be to God." "As is our custom, Vespers were said in the late afternoon, and a special thanksgiving was offered to God for giving us renewed hope through the many signs of land He has provided. I now believe that the light I saw earlier was a sign from God and that it was truly the first positive indication of land." "At dawn we saw naked people, and I went ashore in the ship's boat …I unfurled the royal banner and the captains brought the flags which displayed a large green cross with the letters "F" [Ferdinand] and "Y" [Isabella] at the left and right side of the cross …To this land I gave the name San Salvador, in honor of our Blessed Lord." Throughout the log, Columbus makes it clear why he and his men are sailing across the Atlantic. It was to spread the Good News of Salvation and convert the natives to Christianity. In his opening introduction of the log, he addresses the King and Queen of Spain. "Your Highnesses decided to send me, Christopher Columbus, to the regions of India, to see the Princes there and the peoples and the lands, and to learn of their disposition, and of everything, and the measures which could be taken for their conversion to our Holy Catholic Faith." Columbus went on to identify the chief prince of the Indies, who is called the great Khan, which Columbus said means the King of Kings. And then in a two-sentence statement he tells us why we not only may, but we must call Columbus' coming to the western world the Catholic Discovery of America. "I informed your Highnesses the Great Khan and its predecessors had sent to Rome many times to beg for men learned in our Holy Faith, so that his people might be instructed therein, and that the Holy Father had never furnished them, and therefore, many peoples believing in idolatries and receiving among themselves sects of perdition were lost. Your highnesses, as Catholic Christians and Princes devoted to the Holy Christian faith and to the spreading of this faith, and as enemies of the Muslim sect and of all idolatries and heresies, ordered that I should go east, but not by land as is customary. I was to go by way of the west, whence until today we do not know with certainty that anyone has ever gone there. He sent me that I might bring the true faith to the Indians." This missionary theme is sustained throughout the published writings of Columbus. I think I should insert here, but it is not my manuscript, that how much we've been educated, how many years we've gone to school. Most of us, if not all of us, have been taught a misinterpretation of history. As Catholics, however, we had better wake up because the same forces that are now calling Christopher Columbus an invader or slave trader are those who are using every means at their disposal to crush the faith that we would not have to do unless the missionary, Christopher Columbus, had discovered the new world. It is of more than passing value to read what Columbus wrote on his arrival in the New World. It contradicts so many myths, not only about Columbus, but about his alleged cruelty towards the native Indians whom he found in America. He is still writing on October 12, 1492. "The people here …are friendly and well-dispositioned… who bear no arms except for small spears and they have no iron. I want the natives to develop a friendly attitude towards us because I know they are a people who can be made free and converted to our Holy Catholic Faith more by love than by force. I therefore gave red caps to some and glass beads to others. They hung the beads around their necks …And they took great pleasure in this and became so friendly that it was a marvel. They traded and gave everything they had with good will, but it seems to me they have very little and are poor in everything. I warned my men to take nothing from the people without giving something in exchange." This quotation from his log on October 12, 1492 may seem to be or have been a bit longer than other quotations that I gave in this lecture, but they are not by any means exhaustive. To show how thoroughly Catholic, how deeply zealous and how courageous Columbus was, the more you read of his own writings, the more they reveal what we in our day need to see: that the discovery of America was not accidental, but deeply providential. It was not by chance but eternally designed by God. In the light of what we have so far seen, we not only may but we must see how the Catholic discovery of America. It was Catholic in many ways, but in none more evidently than the apostolic zeal of Queen Isabella and Christopher Columbus. My hope, my deep hope is that the graces that God is giving during this quincentennial year will arouse in all of us something of the zeal to convert our fellow Americans to the true Faith. More than once we have excluded coincidence and chance from the events that led to the discovery of the new world. God had, and has, a profoundly wise plan. It is up to us to recognize His plan and cooperate with His grace for the extension of the Kingdom of Christ and its consolidation in our own land. Christopher Columbus died in 1506. Not unlike his Master, who was crucified and died abandoned by His own disciples, Columbus entered eternity without anyone paying any attention. He died estranged from his own contemporaries. In fact, he died in disgrace. That too is a deep lesson. The price of bringing souls to Christ is suffering. As one historian of Columbus regretfully writes, "It is a very strange commentary on man's forgetfulness of his fellowman that Christopher Columbus, who had filled so large a place in the world at the close of the fifteenth Century, should die and be buried without any unusual expression of public sorrow or even mention end by historian or chronologer" (Robert Fuson, The Log of Christopher Columbus, p. 237). Columbus seems to have died a failure, but God always provides. The same year, 1506, that Christopher Columbus died, St. Francis Xavier was born. Talk about divine timing. Xavier, as you know, is the Church's universal patron – I should add along with the Little Flower – of the missions. Christopher Columbus gave us a mission. He brought the true faith to our land. After five centuries, thank God there are many strongly believing Catholics in the western world. They were under no illusion. Many have discarded the Faith which they once professed. Many others are Catholics only in name. The deepest need of America is for that spiritual food which is Christ's revealed Truth brought to America 500 years ago. Please God we will put it into practice and realize the hopes of the Vicar of Christ, of Queen Isabella and of Christopher Columbus in our day. Thank you for listening.